Thank you for your interest in our Alaskan Klee Kai. If you think that an Alaskan Klee Kai is the breed for you, and you want to be considered as an owner of one of our puppies, then it is required that you complete and return this questionnaire for our review. This is how we pre-approve homes for our upcoming litters. Please be as detailed as possible in your answers to give us a good picture of the kind of home you would offer one of our litter ones. 8/25/15: I am in the process of changing the way our application and waiting list will work. Until the changes are made the application link will not work. The new process and instructions should be posted in the next month. August 2015: Currently no puppies are available. Our next litter is planned for Winter 2015/2016. Aren't AKK just another "designer dog" aka an expensive mutt? This is something I have seen posted on the internet a lot lately and it irks me more than a little. Over 30 years of stringent breeding practices stand behind the dogs we are producing today. Our dogs are not crossbred to other breeds. 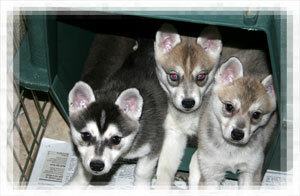 They are bred only to other UKC registered Alaskan Klee Kai. Myself and the other breeders working with this breed, spend a lot of time, effort, and money to see that our puppies never end up in a pet store or are used in irresponsible breeding programs. "Designer Dogs" or Crossbreeds are sometimes produced to serve a certain function, like breeding poodles to other breeds to produce a hypoallergenic dogs which if done with proper health screening by experienced breeders I would not fault in the least. However, most of the time it is done with little thought to the breed characteristics and only to create something that is new and trendy. In recent months it was discovered that one pet store breeder had obtained an AKK and was breeding it to an Eskimo dog and a backyard breeder was creating Shiba Inu/AKK mixes. No health testing was being done, no health guarantees given, no spay and neuter requirements to prevent unwanted puppies from adding additional burden to our animal shelters, and no thought to what type temperaments these crosses might produce. Eskies and Shibas are wonderful dogs, but they have socialization issues similar to AKK. We are currently working to improve the AKK's temperament and in the past 5 years alone UKC judges have complimented our breeders on the progress we have made in producing friendlier dogs through selective breeding practices. To breed the AKK to another dog with socialization issues is nothing short of irresponsible. Our puppies generally range in price from $1800-$2600 plus shipping if required. On occasion we may have a retired breeder that we will sale for less. The price varies from puppy to puppy depending on its features and quality. All puppies come with a health guarantee so a pet quality puppy doesn't mean it's inferior, it just means its conformation to the breed standard may not have been as good as another puppy. What does "Pet Quality," "Show Quality," and "Breed Quality" mean? This is a way of differentiating between a puppy who would make a wonderful pet but maybe has a fault according to the breed standard; such as bad bite or is pure white in color. Neither of these things effect the quality of life the dog will have or it's health but it means it isn't suited for the show ring or to be used in a breeding program. Usually Show/Breed quality go hand in hand but on occasion you may have a dog that is perfect for showing but really shouldn't be bred. So if someone is interested in competition but not breeding the dog would be perfect for them. And then some dogs have nothing to keep them from showing but really are not show quality. They may produce grand champion puppies though which makes them a dog that is more breed quality than show quality. How do I get a puppy from you? To become an owner of one of our dogs you must first fill out a questionnaire to be added to our "pre-approved home list". The questionnaire can be found at the top of this page. Once it's been completed and approved we'll keep you posted as puppies or dogs become available. There really isn't a good answer to that. Once on the list and I see what your preferences are, I can give you a ballpark figure. If I don't think I'll have what your looking for in the near future I'll recommend a breeder that I think will. The more specific you are in your preferences though the longer it will take most likely. Which sizes do you get? All of my current dogs are toys or standards, so basically I can get all three sizes. This really depends on how the children treat the dog and how much effort is put into socializing the dog. If the dog is treated with love and respect it will be a loyal and loving companion. If the dog is treated harshly and/or abused it may respond aggressively. If you train your children how to properly treat animals it should be a good addition to your family. This really depends on the particular klee kai. Some are definitely louder than others. As a breed in general I do consider them to be noisy, but certainly not worse than many other small breeds. How do the do in a hot climate? I wouldn't say they are a fan of it, but with adequate shade and water they handle it about the same is any other breed. In hotter climates the AKK have adapted by having a thinner undercoat. What are some of the health issues, such as common genetic defects, present in the AKK? What health tests do you do on your adults before choosing to breed them, as well as what certifications do they have? All of our dogs have a full physical exam once a year (Including full blood panels) by a certified vet before determining whether or not to breed them. All of our breeding stock is either certified or is being certified with OFA for Thyroid, Cardiac, Patellas, and CERF for their eyes. All of these records are supplied to you when you purchase one of our puppies. What characteristics are important to you when choosing a dog to breed? Health, Temperament, and Conformation (how closely it matches the breed standard). Health is the first thing we do screen for when deciding if a dog will be in our breeding program. A dog that is not healthy or has a condition that it will pass to its offspring should not be bred and will be placed as a loving pet. Second is temperament. If a dog is unusually shy or aggressive it should not be bred. 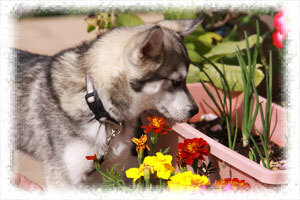 A goal in our breeding program is to produce Klee Kai with more outgoing personalities. Conformation is last but all three of these things are very important. 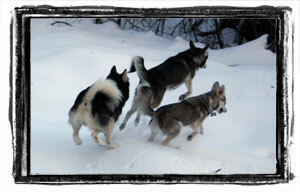 To improve conformation, we plan breedings between dogs which we believe will compliment each other. If I have a dog that is exceptional in everything but it's front, for example, then I'll breed it to a dog with a very strong front to hopefully improve this weakness in their offspring. Are both parents of the litter on site? This question amuses me because my mother used to always say that you want to get a dog from someone who owns both of the parents and has them on site. I do use outside studs particularly when I'm hoping to get a puppy to keep from a litter. That way I can breed her back to one of my own males. If I am using an outside stud he will belong to a responsible breeder who does full health testing on his/her dogs. I will have copies of all the studs recent test results and copies of any certifications he has. So no, both parents are not always on site but I will provide plenty of information and pictures of the one that isn't. Can we come visit the parents and the puppies? What vaccinations, dewormings, etc. will the puppies have before they leave? Puppies will have received at least their 1st set of shots and been dewormed three times before they leave. All shots are kept current until they go to their new homes. What do you supply with your puppies? All puppies go to their new homes with a folder displaying their parents,a picture pedigree, pictures from their birth until present, shot and worming record, all their vet records, microchip info, feeding instructions, a care kit with lots of information, and your contract. Your puppy also comes with it's own crate and bed (if shipped), a bag of it's current food, 1 year health guarantee, and a one year membership to AKKAOA or UAKKA. We don't require a deposit to be placed on our waiting list. Once you are offered a puppy, we require a $100 non-refundable deposit to hold the puppy. At anytime between the deposit being made and the puppy being delivered, we have right to cancel the contract for any reason, at any time. In which case we would return the deposit in full. While waiting for your Alaskan Klee Kai why not join AKKAOA and be kept up the date with all the happenings in the AKK World?